As owners we regularly deal with commonly believed myths surrounding the DeLorean: unreliability, a ‘weak’ engine, poor design. Most will recognize these are altogether subjective or, in some cases, simply not true (alternative facts *cough*). One such annoyingly pervasive myth that is regularly proclaimed by auto journalists is that the PRV was designed as a V8 and subsequently had two of its cylinders chopped off in a knee-jerk reaction to the 1973 oil crisis. This, quite simply, is not true. The tale of two cylinders being axed has been told for likely 3 decades now. This, plus the math involved, has resulted in a believable story. 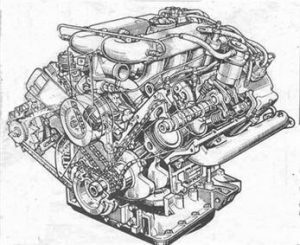 V8 engines are normally designed so that the cylinders fire evenly around the 360 degree crankshaft. This works out to 90 degree firing intervals. Conversely, most V6 engines are designed to fire at 60 degree intervals (360 divided by 6 cyl. = 60) to keep everything balanced. You can see where this is going. According to the story, a 90 degree V8 had two cylinders removed, resulting in a 90 degree V6. When things are repeated over and over again people begin to believe them whether or not they’re true. It’s the hallmark of a great marketing campaign! And this V8 story is no different. I have found a copy of the original Engineering report by the SAE which states the PRV was conceived as a 90 degree oddfire V6 right from the onset, and the reasons why. Considering the math above, a 90 degree V6 does seem illogical. But engineers Francois Gastinne of Peugeot, M. Laliere of Renault and Stephen Wallman of Volvo have spelled it out for us straightforwardly. The 90 degree configuration allowed the engine 1) a broad RPM range (for the time period), 2) to be lighter and more compact (with the wider vee shape giving the engine a lower centre of gravity), and 3) “greater freedom in choice of engine mounts” due to a sinusoidal torque wave running perpendicular to the crankshaft. Also worth noting is the engineers’ calculation of maximum gross horsepower as 140, attained from 2.7L of displacement.